Corinth was a town right where southern Greece and northern Greece come together. 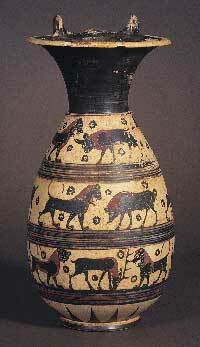 It was certainly a Mycenaean city, because Mycenaean pottery has been found in excavations at Corinth. 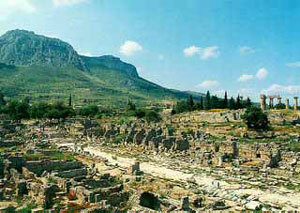 In Greek mythology, Corinth (CORE-inth) was where Jason and Medea lived. During the Dark Ages, Corinth declined like other Greek towns. In the early Archaic period, around 900 BC, Corinth began to grow again. Like Athens, Corinth didn’t have a king anymore after the Dark Ages, but instead was run by an oligarchy of the richest men. After the Dark Ages, the Greeks began to get more and more involved with trade. People were selling glass jars, perfume, pottery, wine, furs, and other things back and forth between West Asia and Greece and Italy. Some things travelled on Phoenician ships, and others on Greek ships. A lot of these ships went through Corinth, because that was the quickest way to sail between West Asia and Italy. People used a tow path to pull boats across the narrow piece of land that separated Corinth’s two ports. 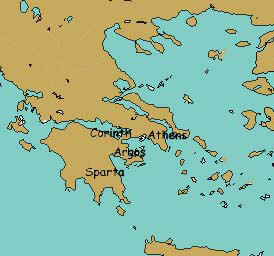 A lot of land trade also went through Corinth, which was on the main road between northern and southern Greece. By around 800 BC, the Corinthians had begun making things themselves to sell to the traders who were always in their port. They made perfume, and fancy little pots to put the perfume in. For a while, these pots were famous, and Corinthians got rich from selling them. Cite this page: Carr, K.E. Ancient Corinth – Mycenaean and Archaic. Quatr.us Study Guides, July 6, 2017. Web. April 21, 2019.